During several hours of intensive Internet searching yesterday, I was unable to discover a single image or significant text regarding the elephant structure that is said to have been a feature of the Exposition Universelle of 1889 in Paris. I have looked without success at dozens of both French and English-language websites. A number of other websites present essentially the same very limited information. No website I have yet discovered, however, provides any photograph of the enormous elephant structure during the period in which it is reputed to have been featured at the 1889 Exposition. Nor have I been able to discover in what part of the Exposition the structure might have been located. 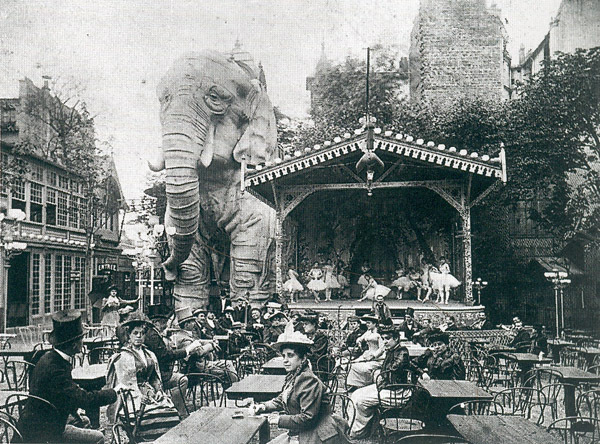 Several photographs of the “Elephant” in the garden of the Moulin Rouge show that its plaster or stucco skin made it look much more lifelike than the sheet metal-covered elephants designed by James V. Lafferty and constructed in Cape May, New Jersey and Coney Island, New York City. Such a plaster of stucco “skin” must have been both very heavy as well as very fragile – and must have made the transportation of the monster an interestingly difficult project in the Paris of that period. If you know of any image of the “Elephant” in situ at the Paris Exposition – or any text regarding its possible function there, I would be most appreciative of your sharing this information with me. If you are yourself not aware of such an image or text, might you perhaps be aware of any website on which I might post a query similar to the one you have now before you? Is it perhaps only a bit of urban folklore that the elephant in the garden of the Moulin Rouge was ever a feature of the 1889 Exposition Universelle? Your response to this query is anticipated with much interest! I would also appreciate hearing from you soon in order to know that you have received this email. I have explored lot of books to find informations on this elephant, but without success. What is amazing is to have no picture about this "building". With the size, I think higher than 10 meters, he should have been "visible" at the Universal Exhibition but this is not the case.